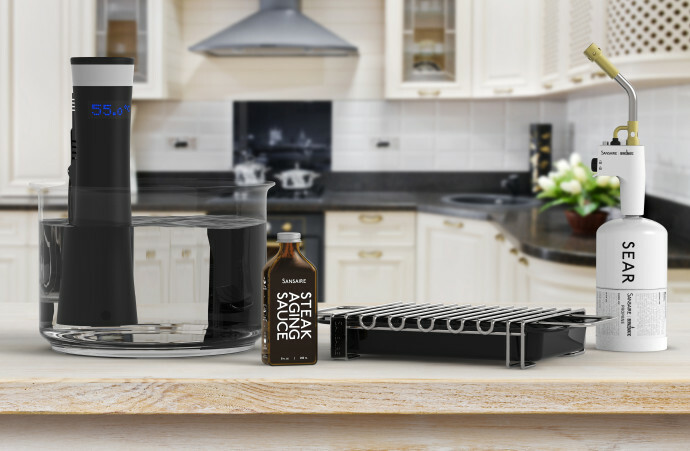 After months of design, testing, logistics, and a half-cow’s worth of steak tastings, I’m thrilled to announce the first two new products from Sansaire since our sous vide circulator! The Sansaire Steak Aging Sauce gives any steak the flavor of 60-day dry aging. Just add one tablespoon per pound of meat to the bag before cooking sous vide – there’s no need to marinate ahead of time. The sauce was inspired by a line in Modernist Cuisine at Home that suggested adding a dash of fish sauce to your steak to add “aged” flavor. We took the idea several steps further, through dozens of rounds of variations. The final recipe is scientifically formulated with a high concentration of glutamic acid, the naturally occurring molecule responsible for the umami flavor we enjoy in aged meats. The natural sugars in the sauce – from fish sauce, soy sauce, and molasses – will also contribute to a rich golden crust when you sear your steak. It makes cheap steak taste expensive, but without imparting a flavor of its own. Think of it as a steak amplifier. But, don’t take our word for it… the reviews are starting to come in. See Sousvidely.com’s Steak Aging Sauce Review. For the last two years, the Sansaire has enabled you to cook your steak to the perfect interior doneness every time, but what about the sear? Introducing The Sansaire Searing Kit, the most powerful culinary blowtorch ever designed for home cooks. Produced in partnership with BernzOmatic – a trusted name in fueled flame products since 1876 – the kit includes a trigger-start torch head, a flavorless propane fuel cylinder, a heavy-duty stainless steel searing rack, plus an enameled tray to catch drippings and protect your countertops from the intense heat of the flame. I had been using a hardware store torch for years to sear my foods, and I can say that larger flame size and increased power of the Searing Kit torch is positively grin-inducing. The clean-burning flame produces no “torch taste” and the heavy-duty searing rack makes cleanup easy – just toss it in the dishwasher. I’ve used the Searing Kit to put a golden crust on a whole prime rib (for 12 people, as they gathered around the kitchen counter in amazement), to sear ling cod for fish tacos, to char peppers for salsa, to fire-roast corn, to brulee watermelon cubes… and other uses that I probably shouldn’t name for insurance purposes. The thing is a beast, and you’ll love the deep crust it produces. 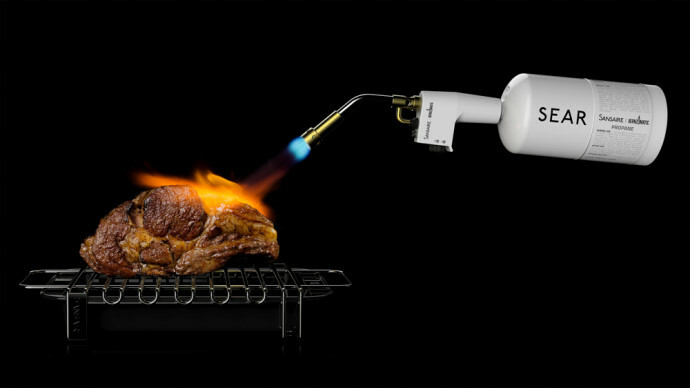 If you’re already cooking sous vide, adding these tools to your arsenal might just turn your kitchen into the best underground, pop-up steakhouse in the neighborhood. If you’re new to the movement, I encourage you to jump on in. The water’s warm!